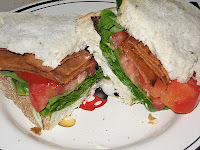 Yummy rosemary olive oil bread; Smart Beat nonfat mayo; roma tomato; spring mix greens; and Lightlife's Smart Bacon. It was my first time trying the veggie bacon... it was pretty good. Kinda dry and hard after being cooked, but maybe I cooked it too long. Overall, a yummy light dinner!